Glasgow weather today was looooovely. Plus, We have a cool schedule at noon. 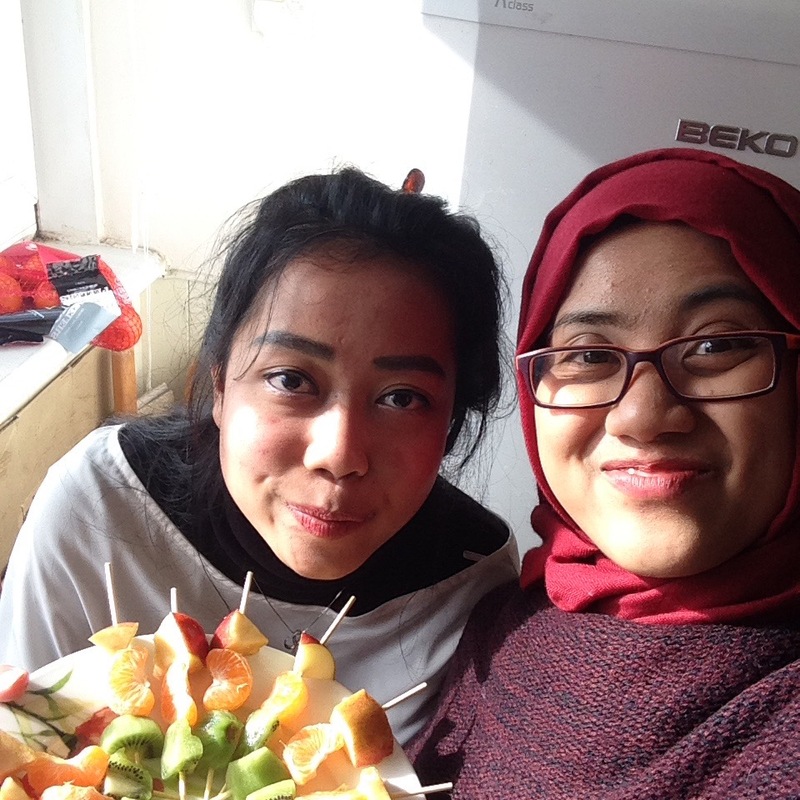 Today, Me, Eva and Maya cooked some Indonesian dishes and invited our friend at the university. Most of them are our classmate at Media Management course. And the rest, Jakub and John are Stella’s friend. We’ve met them at Stella’s friend on a Chinese new year dinner couple weeks ago. The -super fun- lunch was taken place at Maya’s flat so me and Eva approached there at the morning and started cooking at 10.30 am. Me and Eva and our cute and colourful fruit skewers. Firstly, we cooked fried rice with catfish (nasi goreng teri). We cooked this dish twice to make sure the portion is plenty enough for our guests. Secondly, we prepared Capcay with extra chili because we’ve notified our guests that our lunch will be spicy. Thirdly, we cooked Indomie Goreng with green peas and fried shallot for its finishing touch. We also made Capcay, which is our daily dishes in Indonesia, consisted of various vegetables. Fourthly, Maya fried her Ayam Kalasan (Chicken with Kalasan seasonings), which she has marinated the night before. Lastly, we sliced apples, oranges, and kiwis and put them into bamboo skewer or in Indonesia known as tusuk sate. We also melted some chocolate spread as a sauce for the fruits (photo above). Our lunch: Fried rice, Indomie goreng, Sliced omelettes, capcay (mixed saute vegetables), and fruit skewers with chocolate dip. For a dessert, Maya has prepared chocolate pudding from our national brand Nutrijel. It was great, not too sweet, and the fla sauce was fantastic (credit to Maya, hope she read this). 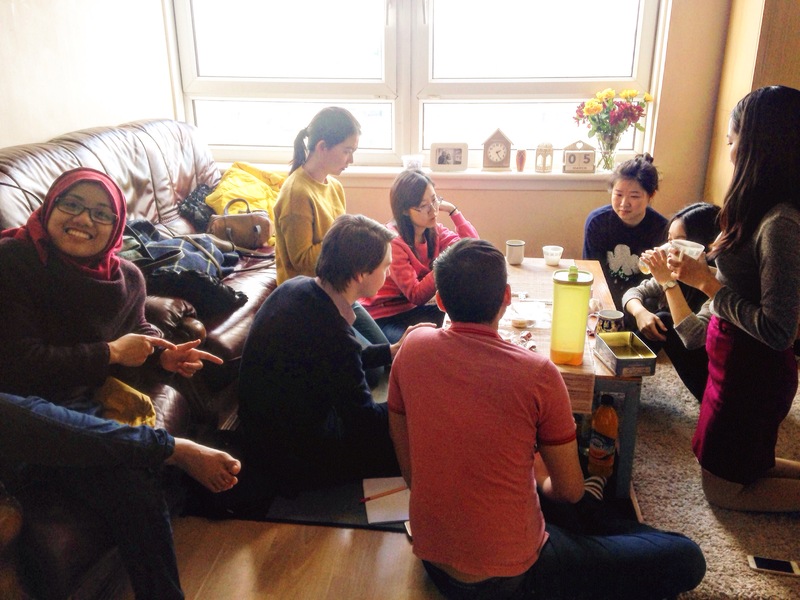 This is my second experience on ‘hanging out’ and eat together with foreigner. I spent most of my ‘eat together’ moment with my fellow Indonesian. Either in Glasgow and in other cities that I’ve ever visited. We shared our culture, daily experience, and even talked about our country history. For the non-native speaker like us, the moment like this might be perfect to improve our speaking skill. Especially for me, where I rarely have opportunity to delivering speech throughout my course. Almost all my assessment are based on writings.